28/65 Kim Hollis Frenetic and ambitious, it's certainly one of the more unique musicals ever created. 43/159 David Mumpower Fun musical offers great combination of prohibition era story and grrrrreat music. 107/200 Max Braden Good cinematography but the movie drags and the music doesn't help. Now that Andre Benjamin has been able to strike out as a credible actor in such projects as Be Cool and Four Brothers, he's ready to stand alongside his Outkast partner Antwan Patton as the duo topline a period musical that features an all-star cast and seems to ring with memories of Streets of Fire, Purple Rain and even The Cotton Club. 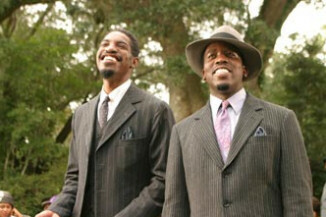 The movie will follow Benjamin and Patton as they are the two central characters in a 1930s speakeasy in the South. Benjamin portrays a talented piano player at the club, while Patton is the speakeasy's manager and lead performer. Naturally, they have to contend with some gangsters who attempt to muscle in on the turf. See the latest developments for this project on the Idlewild Movie News page.